TORONTO - What is new in the 2018 Edition of CSA Z462? The 2018 version of CSA Z462 is characterized by an integration with the risk analysis process, a pyramid describing the periodization of corrective actions is illustrated on the main page of this new version. 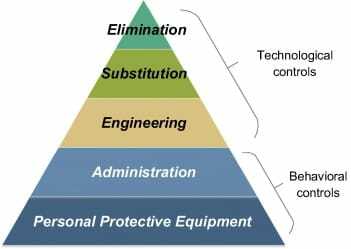 The first step of the process consists of trying to eliminate, at the source, the potential danger, if the residual risk is not tolerable, then it should be managed by substitution and engineering controls actions, finally, administrative controls tools, awareness and PPE are considered as last resort risk reduction measures. The risk analysis approach has been adopted by the new version of the 2018 Edition of CSA Z462 standard. Tasks on electrical installation should be performed after locking out the equipment, however, if a lockout procedure is impractical then, a risk analysis should be undertaken to reduce and evaluate the risk. Here are some of the changes can be expected in the 2018 Edition of CSA Z462 Electrical Safety standard being released in January, 2018. Risk Assessment Procedure has be altered and made mandatory for pre-job planning purposes. The possibility of human error is now a part of pre-job planning process. Job Safety planning requirements have been altered. Shock risk assessment has been changed to match the risk assessment focus, and now is a mandatory requirement in the job planning process. The upper limit for working while exposed to arc flash and blast has been raised. Arc Flash Risk assessment has been altered. A new Table has been added for “ Arc Flash Risk Assessment, Likelihood of Occurrence”. Arc Flash PPE Category Tables have been changed, and re-numbered. An additional table has been designed to show typical Cycle Clearing times. There have been some major changes in requirements for equipment Labeling. A number of updates, or new definitions have been added. Establishing an Electrically safe work condition- this clause has been reorganized. Work involving electrical hazards has been changed, and certain requirements relaxed due to ongoing research on Arc Blast, and effect on workers. Requirement for PPE when arc flash studies have been done- determination of what level of clothing to be worn has been changed. Make sure that you are up to date on these changes. Certified Arc Flash Training From The Electricity Forum Training Institute – Canada’s Leading Arc Flash Training Provider. The Electricity Forum Training Institute will hold a series of Arc Flash Training update courses across Canada in 2018, to bring industrial, commercial and institutional electrical engineering and maintenance personnel up to speed on the many changes taking place in the new 2018 edition of CSA Z462 – Workplace Electrical Safety.